We had a great weekend down South staying at Amy's parents cabin. It was on the way to Monarch Ski area near a town called Salida. It's still in Colorado but was about 3 hours from here. Got there late on Friday night and disturbed a skunk that sprayed straight away. Unfortunately it sprayed right in the entrance way to our cabin! I've never smelt skunk before and I will never forget that odour! It actually infiltrated all of our clothes and we've had to wash everything on our return. Luckily you couldn't really smell it once inside but going in and out of the cabin was interesting. The children didn't notice at all and had a wonderful time. 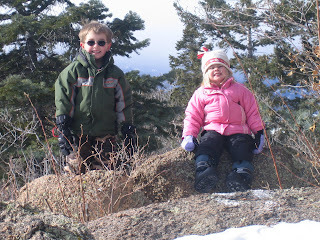 The snow was deep and they loved exploring and climbing on the rocks. 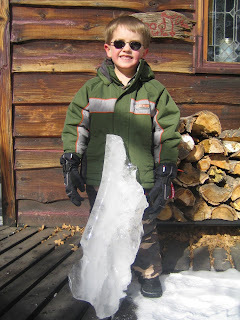 I've included photos of the cabin, Jacob and a bit piece of ice he found and both of them outside. Jacob's now got his new glasses and they are ones that go dark outside. He loves them. Allen and Nick went skiing at Monarch on Saturday morning. We then all met up in Salida for cake. 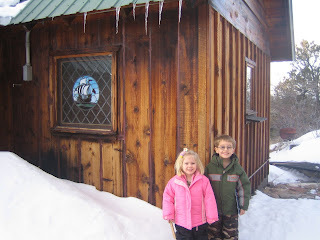 The cabin's were heated by a log fire and there was no mains electricity. We felt very away from it and it was great! No TV or microwave. Things run off batteries and solar power. We want to go back in the summer as it's near the Royal Gorge. There was an outside hot tub that you had to light a fire under to heat up. We lit it Saturday morning and by the evening it was still a frozen block so we gave up! It was very cold but the fire kept everyone warm. Came back in time for Super Bowl. I was more interested in the adverts as all the new ones are shown during the game. The New York Giants won right at the end although I missed it as I was asleep! Kelli, over the road, had kindly invited us over. A bit different to the old Jane Way parties but still nice to be watching it with other people. Took Jacob and Abi home before the end as they were very tired from our weekend away. Allen flies to London next Sunday, I'm not looking forward to him going. Also the Bat Mitzvah next weekend so I'll take lots of photos of the party.